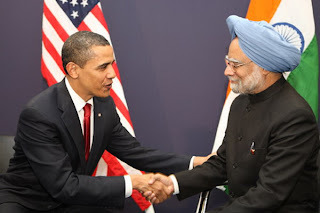 In another major sign of growing ties between the two nations, President Barack Obama on Monday used a speech before India's parliament to endorse India's bid for permanent membership on the United Nations Security Council. Obama, who is on a 10-day tour of Asia, praised "the father of your nation" Mahatma Gandhi and noted his influence on Martin Luther King and the non-violent resistance that typified the American civil rights movement. "I am mindful that I might not be standing before you today, as president of the United States, had it not been for Gandhi and the message he shared and inspired with America and the world," the president said.